I’ve worked in the Wonderful World o’ Journalism for nearly a decade. To say these are dark days for print journalism is a gross understatement. I’ve seen countless friends and even loved ones those their journalism jobs during the past years, as publishing companies dropped employees like amateur drunks drop pint glasses in the wee hours of the night. I’ve watched incredibly talented writers and reporters leave the industry after decades of hard work because they couldn’t make the transition to online or because they could no longer pay their bills with reduced salaries. And to be honest, the situation is not all that much better for Web journalists. Journalism is a largely thankless craft these days, and it can require a lot of levity to keep on clacking those keys. There’s a lot of self-deprecating, gallows humor in today’s editorial offices, at least in my experience. 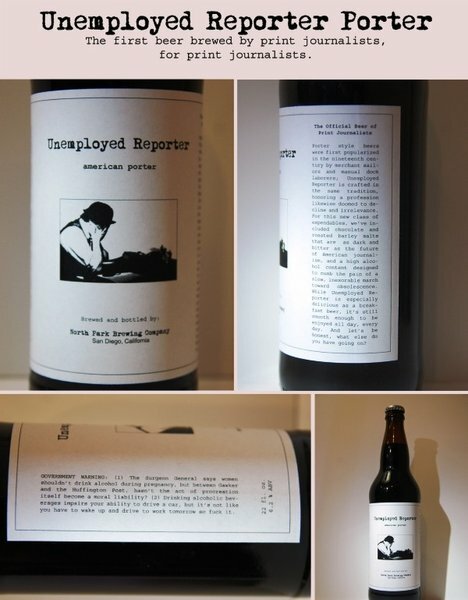 So I got a real kick out of Jon Campbell’s homebrewed Unemployed Reporter Porter. Campbell, a reporter a with sense of humor and an apparent chip on his shoulder, reportedly brewed the beer along with San-Diego-Based North Park Beer Co. and crafted a rather amusing label for his Unemployed Reporter Porter. It’s unclear if Campbell or North Park will ever sell this beer or not—or if this whole thing is just a joke—but if they do, and I can find it, I’ll certainly buy a few bottles. When reviewing beers on this blog, I try to evaluate rare or notable brews that may be hard to find but are also widely distributed. I don’t really see value in reviewing beers that anyone can find every day in their corner liquor store. On the other side of the coin, I don’t really like to review beers that are only available to a small percentage of beer drinkers. I occasionally make exceptions for beers that really blow my mind or for beers that are particularly notable. Today’s review falls into the latter category. Last month, I posted on Maine Beer Co.’s latest creation, King Titus Porter, and I explained how it would soon be hitting beer-store shelves. I found a couple bottles of King Titus this week. Maine Beer Co., a small brewery in Portland Maine, makes exceptional beers, especially their hoppy ales. (Check out my glowing review of the company’s Lunch IPA.) Maine Beer’s brews are only distributed to eight U.S. states at this point: Maine; Massachusetts; New Jersey; New York; New Hampshire; Philadelphia; Vermont; and Virginia. But Maine Beer’s products are so good, it should only be a matter of time before distribution expands, assuming that’s what the brewers want. I poured my 1-pint, 9-fluid-ounce bottle of King Titus Porter into a tulip glass with some force and it immediately formed a thick, frothy beige head. The porter is very carbonated, its head composed of tons of very fine bubbles. Its strong, notable bouquet smells sweet and has a hint of vanilla. And it’s a very dark brown color, like creamy dark chocolate. 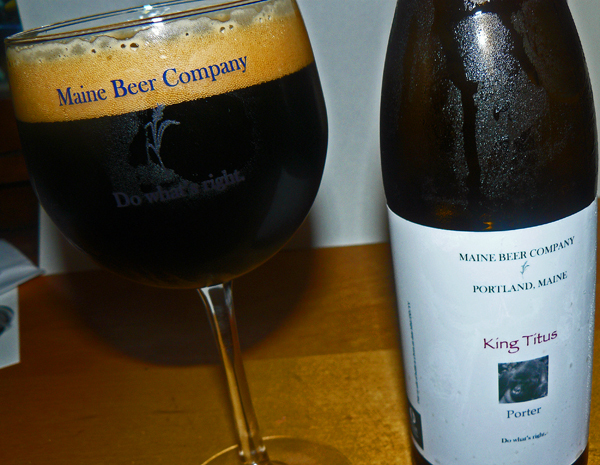 Like all of Maine Beer’s products, King Titus Porter tastes extremely fresh. My King Titus was bottled less than two weeks ago, so there’s a good reason for that. It’s very malty, and very smooth. It tastes of chocolate and caramel malts; it’s brewed with American 2-Row, caramel 40L, caramel 80L, Munich 10L, chocolate, roasted wheat and flaked-oat malts, according to Maine Beer. And it’s also quite hoppy with a bitter finish thanks to the Centennial and Columbus hops. King Titus Porter is 7.5%ABV. And my bottle cost $7.50, which is very reasonable for such a high-quality brew. Honestly, I’m not a huge fan of porters in general. So it’s hard for me rate this particular beer. I can appreciate King Titus for what it is, though: A solid porter created with very fresh ingredients and a lot of love. For that, I give it a 7 out of 10 on the Urban Beer Nerd scale. 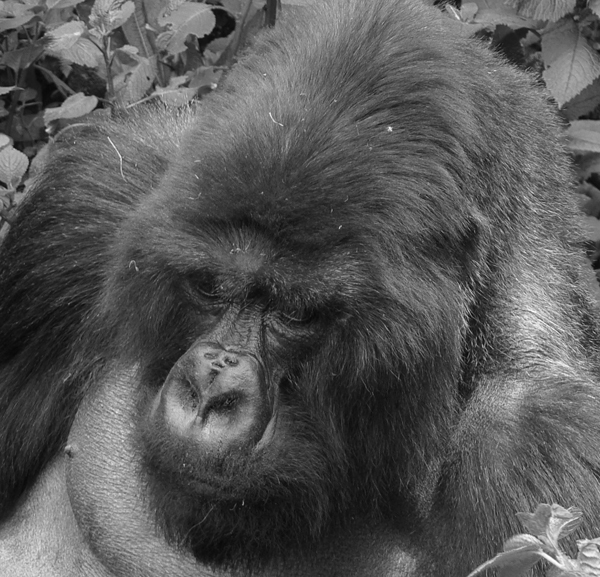 Titus was a wonderful, bold silverback gorilla that led with his heart. The Dian Fossey Gorilla Fund studies and protects these magnificent animals in the Virunga Volcano Mountains in Rwanda. Maine Beer Company proudly supports their efforts. Find more details on Maine Beer Co. and King Titus Porter on the brewer’s website. And check out the video clip below for additional information about the brewery. 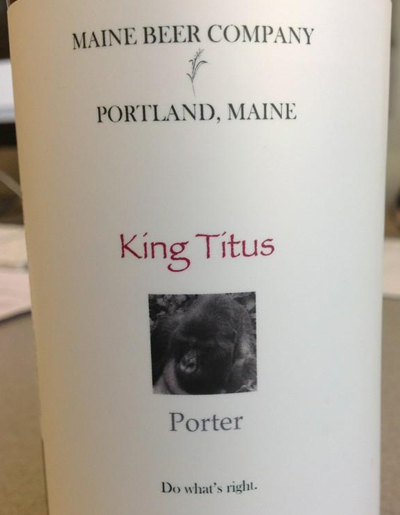 Maine Beer Company said on Twitter earlier this week that its brand new beer, King Titus Porter, will be shipping soon. I’m a big fan of Maine Beer—read why here—so I’m anxious to get my mitts on this new porter. It’s not yet listed on the company’s website, so the only details on King Titus Porter that are available right now are what you see above. Maine Beer Company’s brews are currently available in Maine, Vermont, Massachusetts, New York City, New Hampshire and Pennsylvania. Read more about Maine Beer Company on the brewer’s website.